Barbarians are lightly armored warriors who rely on toughness and mobility in combat. Barbarians may use any weapons and bucklers or shields no greater than 30” in any single dimension. Barbarians may wear AR1 or AR2 armor. Barbarians shun magic and may not receive the effects of any beneficial spells while alive. Armor, weapons and other items carried by the Barbarian may be effected. Barbarians are able to “swing on ropes” during ship battles. At 1st Rank Barbarians gain the ability Shield Break. At 3rd Rank Barbarians gain the ability Cure Light Wounds. To perform this the Barbarian must rest for one minute. This ability heals one light wound on the Barbarian. At 4rd Rank Barbarians gain the ability Climb Walls. At 5th Rank Barbarians gain the ability Toughness and can absorb the damage from any one hit as per the spell Stoneskin. When the Barbarian is struck she must shout “Stoneskin” to acknowledge the absorbed hit. Resting for one minute regains this ability. This ability may not be used while wearing armor. A Barbarian using this ability must visibly wear a black favor at least 2” wide by 12” long with a brown circle on it. Alternately a Barbarian may wear a black headband at least 1” wide with a brown circle on it. At 7th Rank Barbarians gain effectiveness against Giants and are permanently under the effect of the spell Growth when battling NPCs. At 9th Rank Barbarians gain the ability Immunity to Poison. The exact effectiveness of this ability is determined by an elder. At 10th Rank Barbarians gain the ability Stalwart Spirit. This allows them to absorb the damage or effect from any one non-green damage spell. When the Barbarian absorbs a magical effect she must shout “Stalwart Spirit” to acknowledge the absorbed hit. Note in regards to AOE spells, only the Barbarian is immune to the effects. Resting for one minute regains this ability. A Barbarian using this ability must visibly wear a black favor at least 2” wide by 12” long with two brown circles on it. Alternately a Barbarian may wear a black headband at least 1” wide with two brown circles on it. Shields in Darkon are the most effective protection against physical attacks and will block an attack from all non-siege weapons. A participant may only wear one shield at a time (except for bucklers, detailed below), and shields must be worn on the arm in order to provide protection. There may be no shield spikes or other ‘hard’ decorations on the front or edge of a shield. Shields may not be thrown. Shields must be constructed with a solid plywood core at least 1/2 ” thick, and the wood must be well padded on the front, outer edges, and corners, with no less that 1 ½ inches and no more that 6 inches of foam from the outer edge of the core. The wood may contain holes for handles and fitting, but holes to simply to remove weight are forbidden. Any protrusions should be sufficiently padded. Shields 36” and under are not required to have cores, but must be rigid. If the shield has a core, it must have at least 1.5in of foam past the core. All shields must have a cloth or Plasti Dip®. Shields are held by straps or handles, which are fixed into the foam or core of the shield. All exposed bolts or sharp edged handles must be filed down or padded. The area immediately around and in between the straps does not require padding, but must still be safe. If a shield receives three solid hits from a shield-destroying weapon (glancing/light blows do not count) it is considered destroyed and much be dropped. If a particular Relic or spell will penetrate a shield, it will be stated in the description of the Relic or spell. A shield may be made in any style, shape, or size according to the character type restrictions of the participant. The size of a shield is measured by the shield’s largest dimension. If a shield is larger than 36″ it is considered to be a tower shield. Shields that fasten to the arm, leaving the hand free, are called bucklers. Bucklers must be between 12″ and 18″ in size and may be made from 1/4″ thick wood. A participant may wear one buckler shield on each arm, but may not use both a buckler and a normal shield. shieldbreaking weapons will destroy them with two hits (this includes mages shields; if they follow the specifications, outlined in the rulebook, for bucklers). 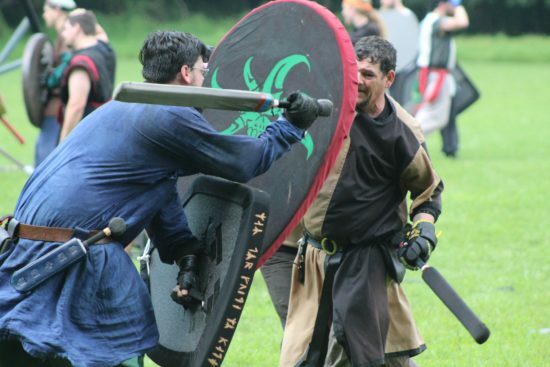 Because it is difficult to remove a buckler during combat, any hits to an already destroyed buckler (still strapped to a participants arm) will count as a normal hit. Again, because it is difficult to remove a buckler during combat, any hits to a buckler which is strapped to an injured arm (i.e. light wound) shall count as though said arm was struck directly. You may not use a melee weapon in combat while holding a bow; you must drop the bow before using another weapon. You may never block or deflect with a bow, including any missile weapon. Participants blocking with bows will lose their arching privileges. Heads of arrows may be colored in any solid colors except green, blue, silver and gold (those 4 reserved for special arrows). Glaives must be between 5’ to 9’ in length. The blade must have easily distinguishable, squared‐off “flats” and edges, and its thickness (edge) must not be more than 2/3 of its width (flat). At least 1/3 of the total length must be blade. No more than 1/3 of the total length may be handle, and the shaft must be well padded. Glaives must be swung with two hands to administer black damage and will administer white damage if swung single‐handedly. At 1st rank, a Fighter gains the skill of ‘Shield Break’. This skill allows a Fighter to break shields with a select list of weapons. In the hands of a Fighter, a Battle Axe, Glaive of 7′ or longer, or a Yellow weapon with a 5’ overall length (except for quarterstaves and Bars) are capable of destroying shields. Clubs and Maces require a striking surface 4” in diameter. Druids may continue to use glaives. Pouch- Syllable count reduced for this spell from 1000 to 500. Add: The spell must be read loudly, so that it is clearly audible to those within 5′ of the caster. People should be able to understand what you are reciting. Players must decline Res/Animate BEFORE spell is cast. Skills are described within the description of each character type, while spells are detailed in Chapter Six: Spells and Magic. Some skills and spells require a favor or headband to be worn. Favors are worn on the waist and are at least 2″ wide by at least 12″ long. These dimensions must be visibly seen and not wrapped to be shorter or concealed. Headbands are at least 1″ wide. Skills and spells that require favors or headbands describe specific colors and symbols to be used. These are found in each ability’s description. In addition, this proposal is to remove the size requirements from each and every skill and spell in the rulebook to reduce word count and redundancy. Descriptions would only include color and symbolism. Changed to be fully reduced at double spell level. IE at level 2 your lvl 1 spells are reduced 50%. At 20, your level 10 spells are reduced 50%. 250 Syllables, Silver Spell Ball component. Same abilities as before. Potions and Scrolls may be created by Mages, Druids, Warrior Mages, and Clerics of 10th Rank or higher. To create a potion or scroll, the maker must inform the Potions and Scrolls Marshal, or the Vice President, at check-in and pay a cost of 1 Gold Piece per spell rank. The maker must also declare at that time what type of Potion or Scroll he is making. The Potions and Scrolls Marshal will then sign and date the potion or scroll, making it valid for use. A potion or scroll is valid up to 1 full year from creation date. Payment is due immediately once the potion or scroll has been signed, and can only be make them during a full day of adventuring (i.e. a participant may not make a potion or scroll on the Friday night of a campout). Potions and Scrolls are considered treasure, and may be stolen or looted. A caster may make up to three potions or scrolls or any combination there of each a day of any that they can. IE three proc fire, or two Giants growth and one Gaseous Form. Removes all mention of new player restrictions (class choice, weapon use, armor use. Players must still attend 5 New Player Speeches. Under countries description on page 17. Entire Elder Tunic paragraph on Page 18. Under “Defunct Countries” paragraph on page 18. Countries would be required to have 4 surcoated members and a banner every 6 events to maintain country status. A player from an official Darkon chapter can check in as any of their characters at a different official Darkon chapter. Credits earned between official Darkon chapters are shared. However, the Secretary of the chapter being visited can require proof of previous credits earned from other official Darkon chapters for those credits to be counted. If a player wants to check in as their character type from a different official Darkon chapter but the character type doesn’t exist in the chapter being visited, the player will be allowed to check in as that character type. However, at the event being visited the player will participate in the event as a Fighter of equal rank to the character type they checked in as. Check in credits earned at the event will count towards the rank of the character type checked in as. Additional credits can also be applied to the character type the player checked in as. An official Darkon chapter can add it into their chapter rules that a specific or unspecific character type that doesn’t exist in their chapter will be played as a different character type instead of a Fighter. Players may grapple freely, so long as they are wearing armor in the unrestricted armor group. Those in the restricted armor group may only initiate grapples with players in that same group. Unrestricted Grappling group: Unarmored, Leather, Hide, Shark. Restricted Grappling group: All other armors. The Shield of Deflection was forged a thousand years ago from the scales of the Dragyn of Sarum. The Shield of Deflection is a 30”round shield that is indestructible. Any character regardless of class may use the Shield of Deflection. The Shield cannot be destroyed by any means including shield-breaking weapons, other Relics, such as the Mace of Disruption, spells, or siege weapons, including catapult balls and ballista bolts. In addition, the shield absorbs the effects of anything that strikes it, including AOE effects from spellballs and siege weapons. Note that the effect must strike the shield to be negated, anything striking the player or near him/her in the case of an AOE spell/effect is not negated. The Javelin of Lightning is a javelin that dates back to the early years of the Skydwellers when the Realm of Darkon was still in its infancy. The Javelin is a throwing weapon only, and cannot be used for stabbing in melee combat. When thrown, the Javelin acts like a lightning rod. Once it strikes its intended target, it does magic red damage as if it were an enchanted javelin, then immediately calls down lightning and does a lightning bolt attack (as per the spell). It cannot be caught or deflected. This magical Arrow was fashioned by the Wood Elves of Tangle Forest. The Arrow will also pierce any armor, shield (except the Shield of Deflection, see below) or weapon, inflicting arrow damage regardless of AR. Shields hit confer an arm wound. The archer must shout, “Arrow of Piercing!” when the Arrow connects with its target to avoid confusion. 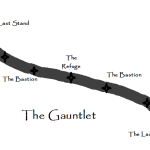 ← The Gauntlet! Woods Battle On February 21st At Pax!